You’ve chosen to become a leader in occupational health and safety. 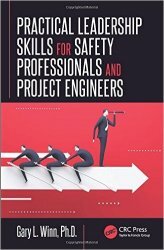 Practical Leadership Skills for Safety Professionals and Project Engineers can show you how. Purposely oriented toward the art and science of leadership, this book is designed to provide insight and outline development techniques for the budding young professional. Aimed squarely at college students and early career professionals, it parallels the steps that a student or recent graduate needs to take (from pre-professional to professional); it moves the reader from the classroom and then on through to early managerial years. The book covers basic office protocol and etiquette, understanding diversity and cultural nuance, and ethical considerations, and addresses most ABET-accredited engineering and safety programs with similar curricula. It also considers special cases that include toxic leadership; environmental stressors; increasing resilience; gender issues; international nuance; experiential training; and "depleted" leader development environments where upper management doesn’t seem to care. In addition, the author introduces stories, accumulated wisdom, and anecdotes from his own experience, balanced by supported research and data on outcomes.